The Minister of State for Culture (I/C), Govt. of India, Dr. Mahesh Sharma, inaugurated the 21-day-long nationwide theatre spectacle at Kamani Auditorium in a program presided over by Dr. Arjun Deo Charan, Acting Chairman, NSD Society and other senior officers of Culture Ministry,in New Delhi yesterday. Renowned danseuse and theatre artiste, Member of Rajya Sabha, Dr. Sonal Mansingh, eminent theatre director and former Director of NSD, Prof. Ram Gopal Bajaj were the Guests of Honour at the inauguration function where Minister of State for Social Justice and Empowerment, Shri Ramdas Athawale was the special guest. The 20th edition of Bharat Rang Mahotsav (BRM), the international theatre festival of India, is organized by National School of Drama (NSD), one of the prominent training institutions in the world. The National School of Drama (NSD) is an autonomous institution under the Ministry of Culture, Govt. of India. The 20th BRM comes with 111 national and international acts in its basket that includes folk and other traditional theatre forms, invitee plays, and productions by the students of the National School of Drama. Shri Suresh Sharma, Director In-charge, National School of Drama, welcomed the guests at the inaugural function and thanked the members of international and national theatre fraternity for gracing the occasion with their presence. He spoke in detail about the wide variety of plays to be staged during the festival and allied events such as ‘Living Legend’ and ‘Master Class’ to be held in New Delhi and 5 other cities. The inaugural ceremony was followed by a 50-minute musical performance ‘Karanth ke Rang’ based on the compositions of late Shri B V Karanth, directed by Shri Amod Bhatt and presented by Rangpurva group, Mumbai. Shri Karanth was a well-known director, actor and musician of modern Indian theatre in Kannada as well as Hindi. His plays like ‘Jokumara Swamy’, ‘Sankranti’, ‘Huchu Kudure’, and ‘Oedipus’ were trendsetters, which touched upon aspects of language music, songs and stylization. Shri Karanth’s use of unusual instruments such as wood, stones, etc. in creating music and his ability to blend contemporary, classical and folk genres reflected his originality and style. He was an alumnus of batch 1962 of the National School of Drama and later became its director. Bharat Rang Mahotsav (BRM), the annual international theatre festival of India is organized by the National School of Drama (NSD), was established two decades ago to stimulate the growth and development of theatre across India. 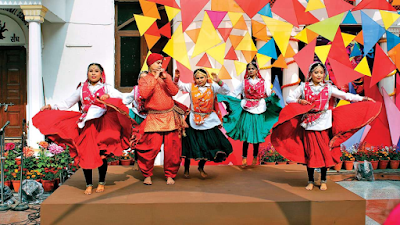 Originally a national festival showcasing the work of the most creative theatre workers in India, BRM has evolved to international scope, hosting theatre groups from around the world, and is now the largest theatre festival of Asia. Till date, BRM was celebrated in New Delhi and has travelled to several cities in India, presenting an overwhelming 1787 plays, and riveted thousands of audiences who basked in the glory of heart-winning stories and superior performances.